Citroen is upgrading its Berlingo Multispace, one of its most versatile family models. The freshly styled Citroen people carrier’s official launch date is 2 April, with pre-orders for purchase, lease, or finance are expected to open earlier. Proving that family friendly cars don’t have to be boring, Citroen have now made the Berlingo Multispace more aesthetically appealing. Its vibrant Citroen personality is emphasized through its new, wider grille and chevron badge, and the bold headlight arrangement. Drawing on Citroen’s impressive history of aerodynamic design, the wing mirrors are now revised and updated, reducing drag and so fuel costs. If choosing to purchase, lease or finance a new Citroen Berlingo Multispace there is also the option of upgrading to new ‘Airflow’ style aerodynamic wheels. The new ‘Black Pack’, with bespoke Onyx Black trim on the exterior gives the Citroen a more contemporary feel. This carries through to the interior, where the finishing has been comprehensively refreshed. 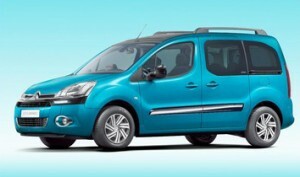 And the Citroen Berlingo Multispace now comes with the choice of two bold new colours: Nocciola and Belle Ile Blue. Robust and practical, the Citroen Berlingo Multispace can be specified with either five or seven seats. You can also opt to fit Citroen’s unique Modutop (R), an ingenious piece of design inspired by the world of aviation. It combines a glazed roof with integral storage compartments, an innovative dual access boot, extra lighting for rear passengers and ventilation that can be controlled individually. Citroen have worked to make the Berlingo Multispace as fuel efficient as possible. As a result the range includes the micro-hybrid e-HDi powertrain and the ultra efficient e-HDi Airdream EGS6. The aerodynamic design improvements have lead to some models now boasting reduced emissions, including the HDi 75 and the HDi 90. Citroen will confirm how much a new Berlingo Multispace will cost to purchase, lease or finance closer to its launch date. If you’re looking to purchase or lease a new Citroen contact our sales team. Alternatively, visit our website where you will find new and used Citroen’s available for sale or on finance.